Warning. This post contains many images created in poor lighting conditions! Apologies in advance. Oh dear. A much loved and well worn pair of slippers came back to me from a friend for examination. I thought I would have matching yarn but I really didn’t. In the end I went for visible mending of this pair and also decided to knit her a new pair. #Menditmay I thought! The next step was knitting a new pair. 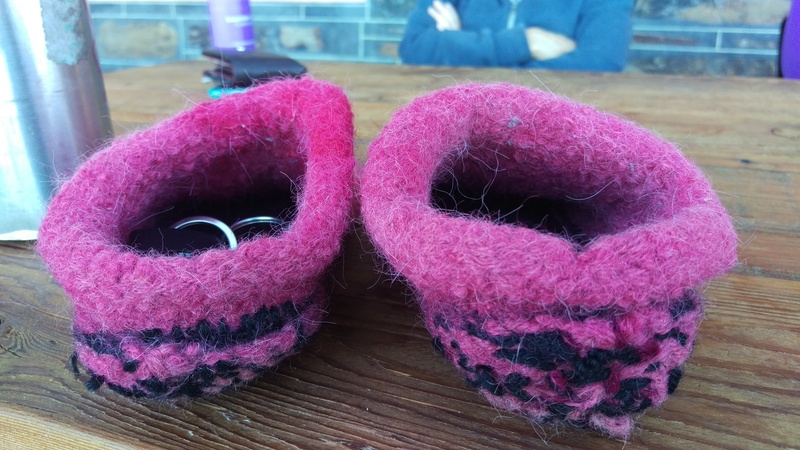 Two pairs for different people, in the end, and two dinners with associated felting (no end to the thrills when you visit us!) With appalling photographs to match. This pair are a rich purple and they are on a blue background, not that it shows. They went to a new home with a cherished friend who has been feeling the cold terribly. She also scored these hand warmers, knit from the remainder of a ball of Noro sock yarn some time ago and awaiting the right moment. They look better on! Then, my beloved negotiated handover of a small pile of pre-loved and partially felted socks that will fit my friend better than my beloved at this stage. Some required running repairs. 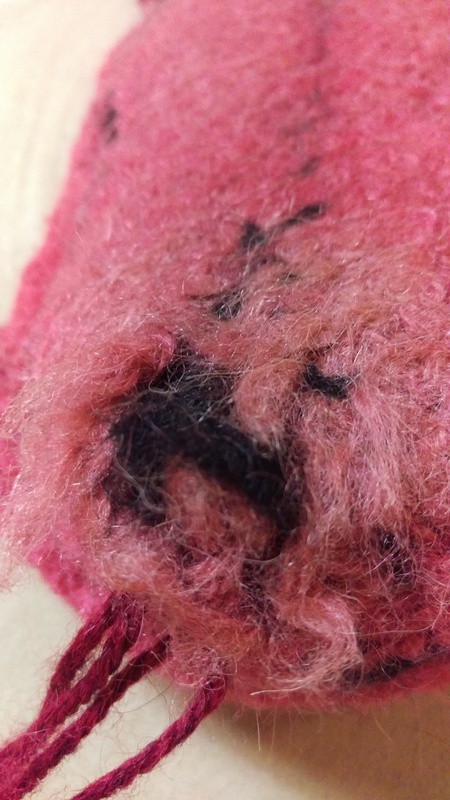 Some were too felted for anything other than brutal patching. No way to knit a patch in. Can’t find any stitches to pick up! Some of these socks were knit before I really understood the kind of yarn that was suitable. But pairs like this, made from Bendigo Woollen Mills 8 ply alpaca, were such a hit among my friends I made a lot of them anyway. I’ve since had an email about blue socks being worn at Pilates class and a photo of my friend’s ankle as she heads out to dinner in handspun, handknit socks! Too good. These are the people for whom hand knits should, indeed, be made. 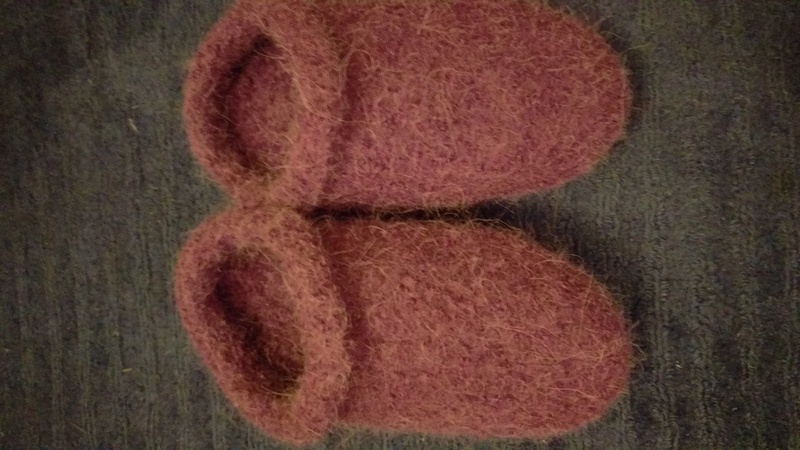 And finally, the friend whose slippers I was darning at the top of the post came over and I felted her new slippers to size. She arrived wearing hand knit socks… perfect! I posted a comment and it disappeared…it read something like…where are the badly lit photos? All I can see is gorgeous, much-loved, expertly-crafted goodies given renewed lives for happy friends. Thank you again. Thanks you for such a delightful and kind comment!!! I am sorry yours need mending, Manja, but glad they have it. Wabi sabi is such a wonderful idea, isn’t it? I reckon the darn on those slippers are pretty haphazard 🙂 but they will hold them a while longer. I love that you have found a pathway to appreciation. Perfect! I love the mended slippers – I like to see contrasting mends. Really inspiring post – thank you. Thank you so much, Norma! I like a contrasting mend too… and I am delighted to have inspired you.